In preparation for the Bounty Hunter rework, we're looking to make some popular requested balancing changes to PvP, with a focus on Bounty Hunter in particular. Alongside these, we'd like to poll a few recently suggested QoL changes. In July 2018, we announced some unpolled changes we intended to make to PvP that we considered to be matters of balancing, intended to benefit those who engage with the content the most. If you missed it, you can find the detail in this blog post. The changes were very positively received by both the PvP community and the wider playerbase. The first thing we'd like to change is the Bounty Hunter overlay, but only slightly. We'd like to improve the functionality of it by allowing players to move the position of the overlay to the left, right or middle of the screen on desktop only, and the added functionality of collapsing the overlay so it can be hidden on both desktop and mobile. Since implementing the option for all players to toggle the ability to receive a Bounty Hunter target past level 10 Wilderness, which once toggled on causes players to only get targets in levels 1-10 of the Wilderness, we've been made aware of several problems regarding the Bounty Hunter targets players are receiving. The Wilderness has always been famed due to the concept of risk vs reward, but when fighting another player, it can be difficult to ensure they're risking an amount worthy of your own risk. Whilst it is possible to skip these lower value targets, it's more often than not that players find themselves stuck waiting either 30 or 3 minutes to receive another target due to skipping too many times. We'd like to improve the experience for players wanting to get stuck into the action of Bounty Hunter by allowing them to freely skip their target if they aren't risking a Mysterious emblem. In addition to this, we'd also like to change it so that players are able to freely skip their target if said target doesn't have a PvP Skull. Whilst most players that fight without a skull are wearing gear of very high value, the player with the skull typically risks more or the same amount but is at a huge disadvantage due to the difference in the quality of gear being worn. This should make it so those looking for a fairer fight are able to do so without having to worry about having a cooldown for skipping too many targets. When two targets are fighting one another, it's currently possible to skip your target mid-fight. This can be rather frustrating at times, due to the way Bounty Hunter targets get priority over combat compared to others trying to intervene with a fight. We'd like to change it so players are unable to skip their target whilst in combat with said target. The final change we'd like to make is that you are required to have a Mysterious emblem in your inventory in order for you to be able to receive one as a drop from killing your target. Players that are unable or unwilling to purchase their first Mysterious emblem from the Grand Exchange will need to obtain one from Wilderness Slayer before heading onto the battlefield! When a player has been assigned a target in Bounty Hunter, that target is locked in until either player decides to skip, leave the Wilderness for 2-minutes, or log out. It is currently possible to step in and out of the Wilderness in quick succession to prevent the 2-minute timer from going down as fast as it should, meaning if a player wants to grief their target, they can make them wait around 5 minutes before the target is lost unless they choose to skip them. We'd like to prevent this from being so easy to abuse by changing it so players must be in the Wilderness for at least 6 seconds before the timer stops going down. It's currently possible to instantly destroy a Mysterious emblem, meaning not only do you lose it, you also prevent any opponent you might be fighting from getting it. We'll be changing it so that you will have to wait 6-seconds in order to destroy a Mysterious emblem, regardless of you being in combat or not. The Clan Wars portal is commonly used by many players for many reasons. The most common reasons are for replenishing health and run energy. We don't want to change this functionality, but there is an issue where it's currently possible for you to engage in combat with another player, gaining a skull, then use the Clan Wars portal to remove that skull. When this is done, you can return to combat with the same player but you will no longer receive a PvP skull. We'll be changing it so that if you lose your skull via the Clan Wars portal, you'll always get a new one when you next attack another player. In PvP worlds, the moment you step into a safe zone you can no longer be attacked. We think this functionality should remain for those not engaging in combat, but players rushing from the safe zone and attacking players outside of it, only to return to the safety of the safe zone moments afterwards is an increasing problem. We'd like to change it so that if you engage in combat with another player in a PvP world, you can be attacked back by that player for 6-seconds after entering the safe zone. This means you will be able to step in and out of the safe zone safely without being attacked whilst inside the safe zone unless you have attacked another player. If that is the case, then only the player you attacked would be able to attack you back. Anglerfish are commonly used in both PvP and PvM, and for good reason. They give you the ability to heal above your maximum Hitpoints, making the maximum Hitpoints possible be 121 if you use them at 99 Hitpoints. This is heavily utilised in PvP situations to ensure the player remains safe and has less risk of being killed with a combination of attacks. We'd like to keep the ability for Anglerfish to overheal in both PvP and PvM, but we'd like to change how they work when used within the Wilderness and on PvP/Bounty Hunter worlds. The change would mean that the overheal effect of Anglerfish would only apply when they are used outside of combat when in the Wilderness or on a PvP/Bounty Hunter world. Energy Transfer is a Lunar spell that restores all of the targets run energy and special attack. It is commonly used in PvP worlds to fully restore another players special attack multiple times whilst they're in a fight, giving the person who Energy Transfer is being cast on a distinct advantage over their opponent. We'd like to change the way Energy Transfer works in PvP Worlds so the target of the spell must have been out of combat for 15 seconds before it can be cast on them. The term "spec tabbing" is often used in PvP scenarios, and it refers to the situation where a player unloads their entire Special Attack on an opponent and instantly teleports away. This could be at the start or at the end of the fight, but the intention is to try and get lucky with a high damage hit without taking any risk, as the act of teleporting negates any damage they would have taken. To help promote more of a fairer PvP environment, we'd like to make it so that you are unable to teleport for 3 to 6 seconds after using a Special Attack whilst in the Wilderness or in a PvP/Bounty Hunter world. This would also prevent you from entering a Player Owned House portal. Certain players at PvP hotspot locations will attack another account without dealing any damange or being attacked back, meaning neither player is at risk of dying nor can they be attacked by others. For example, Player A will attack Player B with low offensive items, and Player B tanks the damage and doesn't attack back - neither Player A or Player B can be attacked as they're both in combat. When another player enters the area, let's call them Player C, Player A will stop attacking Player B and be able to instantly attack Player C. We'd like to change it so that Player A and Player B will need to be attacking each other, else after a certain period of time, they'll both be able to be attacked by anyone. We recently made some changes intended to tackle the issue where a player gets a kill in PvP and receives no loot. Whilst we've made some good progress with preventing these instances from happening, it still occurs in certain situations. We'd like to improve this further by changing it so that if your opponent has been out of combat with their previous opponent for 18 seconds, or if they use a bank, you will be assigned the loot should you kill them. This blog has had a heavy focus on balancing changes that we do not intend to poll, but we also have some questions we'd like to put forward to you, the community, to vote upon. The first question we'd like to offer you is regarding the Rune pouch. The Rune pouch is a strong piece of equipment used in both PvP and PvM. Players have often asked why though, given its uses, has it been exclusive to the Bounty Hunter store? Locking it behind PvP content has resulted in players feeling forced to participate in Bounty Hunter who would prefer not to, and instead of getting their Mysterious emblems via killing Bounty Hunter targets or Wilderness Slayer, have instead opted to "trade for kills" with other players. We'd like to offer to potential for players to be able to obtain the Rune pouch outside of the Bounty Hunter store, in the hopes that by having only those interested in Bounty Hunter feel drawn to the area, improving the overall quality of the minigame for those who play it as intended. Should the recently released Spellbook filters available on mobile that allow players to hide spells they don't wish to use and make the remaining icons bigger, also be added to the desktop version? 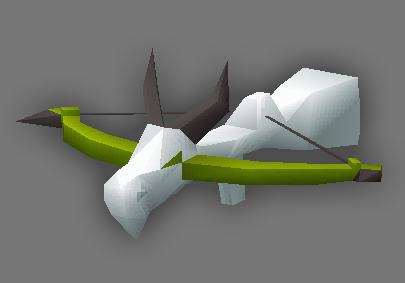 In the near future we'd like to offer players the ability to change the colour of the Dragon hunter crossbow by using a King Black Dragon head or Vorkath head on it. We could alternatively give the ability to unlock these recolours via Ornament kits from Elite and Master Treasure Trails. We'd be interested to hear your thoughts on this, so please let us know what you think!